How Fast Does Mould Grow On Building Materials? Under experimental conditions moulds are found to cover artificially inoculated building materials in 4-10 days. For example, fast growing strains of Stachybotrys chartarum produce visible mould growth on new water-damaged gypsum boards in 5 days. Slow growing strains of Stachybotrys take 14 days to completely cover the test materials. These observations suggest that visible mould growth could appear within 1-3 weeks after water damage. Under natural conditions mould growth is influenced by a number of factors. Type of mould: All moulds don’t grow at the same rate. Some moulds grow faster than others. For example, under the same conditions of growth, Ulocladium would grow faster than Stachybotrys. Temperature: Moulds grow faster at or closer to their optimal temperature for growth. For most indoor moulds the optimal temperature is around 25 °C. However, mould can still grow at temperatures as low as -7 °C. Some species of Cladosporium and Penicillium are capable of growing on wood at -5 °C although spore germination requires at least 0 °C. At low temperatures mould growth is very slow. Water activity: Growth rate of mould increases with increasing water activity. Most indoor moulds have their optimal water activity at 0.96-0.98. Lowering the water activity of the material lowers the growth rate significantly. However, a few species such as some species of Aspergillus, Penicillium, Eurotium and Wallemia are able to grow at lower water activities. Germination of spores requires slightly higher water activity than the minimum required for growth. Age of the spores: Older spores require longer time to germinate than relatively younger spores. The spore load: If a building is full of settled viable spores, mould would cover a wider area in a shorter time, than, if there were a few settled spores. Composition of the building material: Most building materials derived from plants are highly susceptible to mould attack. For instance, wallpaper allow fast growth for cellulolytic moulds such as Chaetomium and Stachybotrys. pH of the material: pH of the material strongly influences the rate of mould growth, sporulation and metabolite production. Some moulds such as Aspergillus fumigatus grow best in the pH range from 4-7 and less well at acidic and basic extremes. Nutrient availability in the material: Growth could be unrestricted if all nutrients are in excess but restricted when not all nutrients are in excess. Presence of antimicrobial compounds in building materials: Some building materials contain antimicrobial compounds. These compounds slow down mould growth. Competition with other micro-organisms: In a moisture damaged environment, there is a great diversity of microorganism. These microorganisms (including bacteria) compete for nutrients and also produce by-products that may inhibit the growth of other microorganisms. Fast growing moulds tend to over-grow slow growers. Since there are many factors that influence mould growth in buildings, it is hard to say when mould growth started. However, if we know where and when the moisture problem started, we could speculate how long the mould growth has been there. Nielsen, K. F. (2002). Mould growth on building materials. Secondary metabolites, mycotoxins, and biomarkers. Ph.D. Thesis. BioCentrum-DTU, Technical University of Denmark. 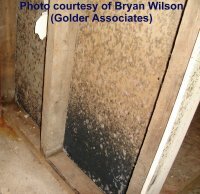 For more information on mould growth, please visit http://www.moldbacteria.com/ or call 905-290-101. Mould growth only occurs in moisture-damaged and damp building materials. The main causes of mould growth in buildings, therefore, may include poor maintenance and lifestyles of occupants, defective construction and use of building materials susceptible to mould attack. It is estimated that up to 40% and 30% of buildings in the USA and Canada respectively have mould problems. Several studies suggest that people living and working in damp or mouldy buildings have a higher risk of respiratory health problems such as asthma and bronchitis. Other symptoms associated with mould growth and dampness include blocked nose, itching eyes, and skin irritation. In agricultural environments, where the concentration of spores is several magnitudes higher than in indoor air, inhalation of spores has been associated with cancer, premature birth and farmers lung disease.